Hey! Why are you standing over there by that bin precisely 102m east of my present location? Sorry, I can’t hear you. You’ll have to shout. Put down that copy of the Journal Of Geodesy and look at me – one foot in the western hemisphere, one in the east! Woo-hoo! What do you mean? This is the Prime Meridian. There’s a metal strip in the ground and everything. 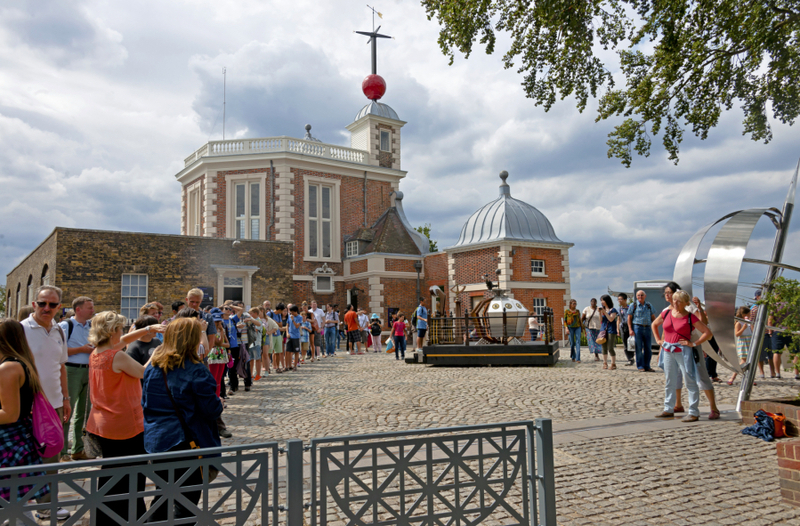 Royal Observatory in Greenwich – birthplace of time, selfies and the commemorative tea towel industry. It’s true, the 1884 International Meridian Conference in Washington gave Greenwich the “common zero” degree of longitude in a vote of 25 nations winning against rival claim by France, who refused to vote and didn’t accept the decision until 1911. Yes! England 0º, France 2º. In your face, Frenchies. But according to research at the US Naval Observatory and the National Geospatial-Intelligence Agency – and my iPhone – the Prime Meridian is actually 102m east of you by this bin where I’m standing surrounded by all these wasps. I should not have bought this Nutella Gelato. You look perplexed – although it’s hard to tell looking through those railings. Let me explain. When the scientists originally fixed the Prime Meridian in the 1840s they used a “clock star” observed through a telescope placed – so they thought – at true vertical – but there were flaws in the calculation. Pah! You had one job Astronomer Royal Sir George Biddell Airey. It was assumed that the Earth was a perfect sphere, which it isn’t, and the gravitational pull was uniform, which it isn’t, hence the discrepancy. This is big news! I need a second opinion. How about public astronomer Dr Marek Kukula. He’s surely going to defend the integrity of the Royal Observatory’s linear money-spinner. Hey, Dr Marek! Get over here. What have you got to say for yourself? OK, you’re not helping. Surely the Prime Meridian is just a man-made construct anyway. Couldn’t we just have another vote, shunt everything back round and restore order? Otherwise this commemorative tea towel is just a lie. Drying my mother’s lasagne dish would be an act of deceit. Think of all the disappointed mothers for one flipping second, you callous brute! We did make the change. In the 1960s the first satellite navigation system Transit chose a non-Earth-centred ellipsoid as the basis for its longitudinal co-ordinates, one free from the variations in the planet’s surface. When it was stationed over Greenwich, it found the Prime Meridian to be 5.3 arcseconds east of the Airy Transit Circle, its presumed location. This was officially accepted as the IERS Reference Meridian by the Bureau International de l’Heure in Paris in 1984. Curse those Frenchies. They never forgave 1884, “it’s coming home”, one line on my shirt and all that. There is some good news. The tectonic plates are shifting the Airy Transit Circle 2.5cms a year so one day, many millions of years from now, the two will coincide. That doesn’t help me and my OCD. I’m getting the sweats just thinking about it. More good news. Over here by the litter bin it’s free. That would have been good news, like, half an hour ago before I paid £9.50 to stand on this meaningless tramline. Put this commemorative tea towel in the bin, would you. I’m not travelling half way round the world just to collect your rubbish. Very funny. By the way, there’s a wasp on your arm.